WhatsApp allows you to Chat, share Pictures, Videos and make free Voice Calls to your family, friends and Contacts located in any part of the world. 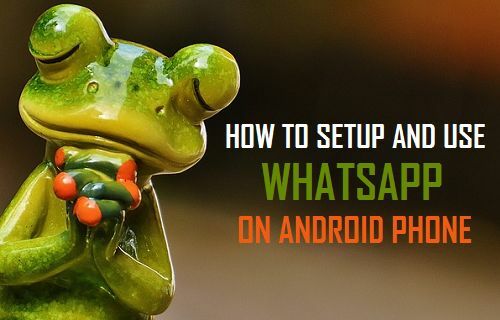 You will find below the steps to Setup and Use WhatsApp on your Android Phone. Unlike other online services, you cannot create a WhatsApp account using your Email Address as WhatsApp Messenger verifies its users via phone numbers. Hence, make sure that you do have an active phone number that you can make use of to create your WhatsApp Account. In general most people make use of their Mobile Phone Number to create a WhatsApp account. 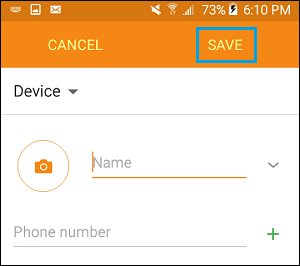 However, you can also create a WhatsApp account without a mobile phone number or an active SIM card by using a workaround provided in this article: How to Use WhatsApp Without Phone Number or SIM card. 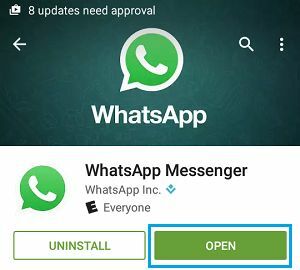 Follow the steps below to download and Install the latest version of WhatsApp from Google Play Store to your Android Phone. 1. Open Google Play Store on your Android Phone. 2. 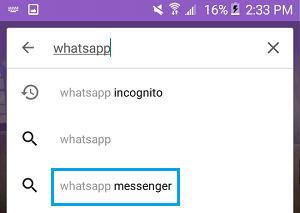 Search for WhatsApp on Google Play Store and tap on WhatsApp Messenger as it come up in search results. 3. 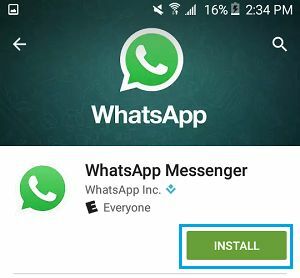 Next, tap on Install to download WhatsApp to your Android Phone. 4. 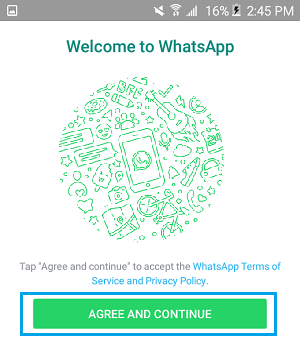 On the next screen, tap on Accept to provide WhatsApp with access to your contacts, photos and others (See image below). 5. 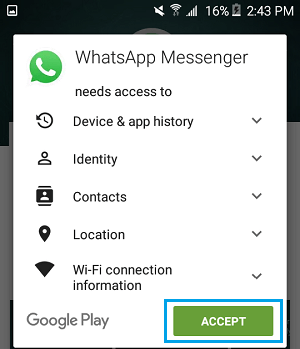 Once you tap on Accept, WhatsApp Messenger app will start downloading to your Android Phone. 6. After WhatsApp is downloaded to your device, you will see an option to open WhatsApp. Tap on Open. 8. On the next screen, select your Country, Enter your Phone Number and tap on Next. 9. 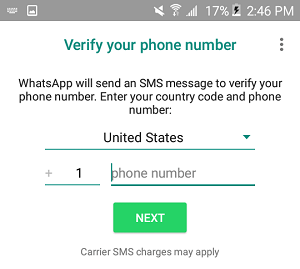 Once you provide your phone number, WhatsApp will send a six digit verification code to your phone number by SMS Message. 10. On the next screen, enter the six digit Verification Code as received from WhatsApp. Do not close the screen or try to change the phone number, in case you did not receive the verification code by SMS. 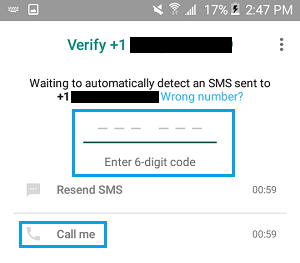 Just wait for five minutes and tap on the Call Me option to receive the verification code via the WhatsApp Automated Calling system. 11. On the next screen, enter your Name and tap on Next. 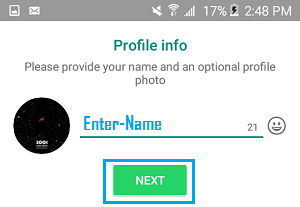 You can also upload a profile image and come back to your Profile at any time to change your name or to upload a different profile picture. 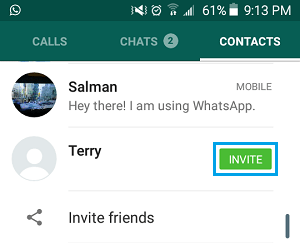 Once activated, WhatsApp automatically goes through the Contact List on your Android phone and adds Contacts to your WhatsApp Account (those who are on WhatsApp). In case some of your Contacts are not on WhatsApp, you can send them an invitation to join WhatsApp by following the steps below. 1. Open WhatsApp on your Android Phone. 2. Next, tap on the Contacts tab from the top menu. 3. On the Contacts Screen, tap on the green Invite button beside the contact’s name. 4. The next screen will open with a pre-composed ready to send Message, simply tap on Send to send a WhatsApp invitation to your Contact. Follow the steps below to add New Contacts to WhatsApp (those who are not on your Contact List). 2. Next, tap on the Contacts tab and then tap on +Add People icon (See image below). 3. On the next screen, fill in your new Contact’s Name, Phone Number, other details (if any) and tap on Save. Initiating a Chat with any of your Contacts on WhatsApp is easy. 2. Tap on the Contacts tab from the top menu. 3. On the next screen, tap on the Contact’s Name that you would like to Chat with. 4. On the next screen, type your Message and send the Message. WhatsApp allows you to place free local, national and International calls to any of your Contacts, as long as you are connected to a WiFi network. 2. Next, tap on Calls from the top menu. 3. Now tap on the Call Icon from the top right corner of your screen. 4. On the next screen, select the Contact that you want to call. 5. WhatsApp will start ringing your Contacts Phone number.